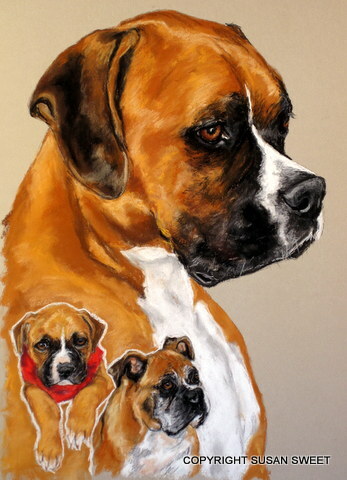 Portraits of cats, dogs, horses and cattle are available in pastel or acrylic. I work from photographs provided by the client, or in certain cases I may be able to meet the animals and photograph them myself. Pastels are matted with backing, and framing is extra. Acrylics are on canvas or board and unframed. Sizes start at approximately 5 by 7. 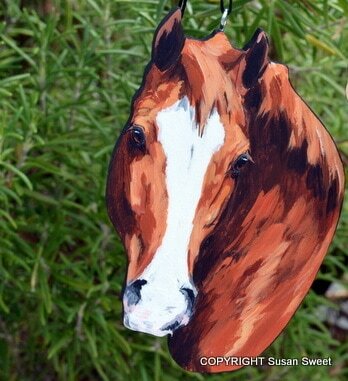 I also create custom hand painted Christmas ornaments of animals. Cut from local pine, painted with acrylics on one side and in the shape of your pet. Heads or full body available. And the 4 by 4 square paintings are also available as custom work.